AKIPRESS.COM - Ata Meken faction leader Omurbek Tekebayev talked about president's successor, constitutional provisions, sovereignty issues in the interview with AKIpress prior to election of the Speaker of the Parliament yesterday. - Some claim the Constitution contains the provisions that undermine the statehood, what would you say about that? - Sovereignty of the state is not absolute. International treaties restrict sovereignty in that or another way. Even economic unions, such as Eurasian Economic Union, restrict sovereignty of the country in some areas to a great extent, when states can't make decisions on their own. In some cases decisions can be made by supranational bodies. Kyrgyzstan is signatory to different international treaties and undertakes certain obligations. This provision is reflected in the Constitution, which reads international law is part of the national legislation. What about Constitution of other countries? The Article 15 of the Constitution of Russia stipulates that the universally accepted norms of international law, international treaties are the integrate part of the legal system. In case international treaties have rules otherwise than those of the national legislation, rules of international treaties will be applied. This is the country that claims for the status of the world order center and as no other country it should defend its sovereignty. But Russia has gone further than Kyrgyzstan and openly says international law has a priority. Same principles are formalized in the Constitutions of Georgia, Kazakhstan, Moldova, Uzbekistan, Tajikistan, Moldova, Georgia, etc. Restriction of sovereignty and compliance with undertaken obligations is the basis of the international law and modern world order. This is stipulated by the Vienna Convention on Consular Relations. The International Covenant on Civil and Political Rights entered into force in March 1976. The UN Human Rights Committee was approved in September 1976 on the basis of the Covenant in line with the Optional Protocol. Kyrgyzstan joined the Optional Protocol to the International Covenant on Civil and Political Rights on 12 January 1994, that is voluntarily and knowingly restricted its sovereignty. Individual complaints of citizens of Kyrgyzstan are considered on the basis of those documents. - Does this pose threat to sovereignty of Kyrgyzstan? - I think there is no any threat. Decisions of the UN Human Rights Committee are not binding. The Committee just communicates its views to a member state and that is all. - The Article 41 of the Constitution says if international bodies confirm violation of human rights and freedoms, the Kyrgyz Republic should take measures to their restoration and/or compensation of damage. - Current Constitution protects human rights to a greater extent than previous Constitutions. The second paragraph of the Article 41 of the Constitution reads everyone has the right to apply in accordance with international treaties to international human rights bodies seeking protection of violated rights and freedoms. In case these bodies confirm violation of human rights and freedoms, the Kyrgyz Republic should take measures to their restoration and/or compensation of damage. This does not mean any international body, but a body in which Kyrgyzstan is a member state and which can make binding decisions. I think panic of certain speakers is unfounded. I want to declare it officially. The UN Human Rights Committee could consider Askarov's case without taking the Article 41 of the Constitution into account. Besides, this is not the first case. 16 complaints were supported in favor of citizens seeking protection of their rights in previous years. - Why was this issue raised now, do you see any political motivation here? - Amendments to the Criminal Procedural Code were adopted in Kyrgyzstan in 2014. The amendments say the investigation of new circumstances of a criminal case will be relaunched upon recognition of violation of human rights and freedoms by international human bodies in which Kyrgyzstan is a member state. However, this does not predetermine decision of the court. This is just modality of implementation. These changes could be incorporated without the Article 41 of the Constitution. Of course, there is political motivation behind the issue. - What would you say about work of Kyrgyz authorities on this issue? 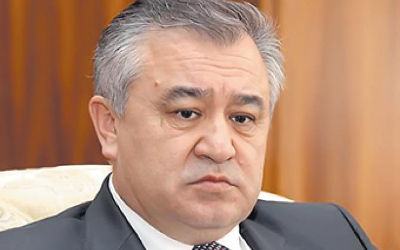 - Kyrgyzstan should provide information to the Committee once a complaint is filed. As far as I know such information was provided and it was prepared by a special commission. It questioned around 100 witnesses. But the Committee says Askarov and his attorney were not questioned. This demonstrated incompleteness of work. - Do you see lack of professionalism in that? - Local courts were unable to complete the task. The case will be considered now by the Supreme Court. This is a precedent. If Askarov was not member of the ethnic conflict, such precedent would be considered by progressive part of our society as a big progress. In fact, condition of our prisons is awful. The state should pay attention to that. - You are saying the President's influence is lessening. What do you mean? - Lame duck phenomenon is a universal thing that happens in all countries. What does this mean for us? The President and his party are the basis of political stability. This is doubtless. People ask when the president leaves and president from a different party comes, will SDPK keep its leading position? In course of time the president loses his power and politicians will make stakes on the next president following the king is dead – long live the king principle. Many politicians, businessmen won't link their future with Atambayev. - It has started and is progressing. Naturally, Atambayev and people surrounding him should compensate these losses in the eyes of general public. - Are you ready to help with that? - Yes. Prime Minister Sooronbayev is the veteran of SDPK party, a close supporter of Atambayev. I think if a representative of SDPK becomes Speaker, this could compensate losses (the interview was taken prior to election of former leader of SDPK faction Chynybai Tursunbekov as Speaker). - Won't we have situation when future will be determined inside SDPK party? - When there are real threats in the region, risks of political destabilization, I mean terrorism, third forces, political stability is very important. I would like the current political configuration to keep until election of a new head of state. - But if everything remains as now, then chances to keep everything unchanged in future will be big? - Chances of the president's placeman will grow, but only if the choice was right.